SEO for Travel Companies in 2018. What’s changed, what you need to know and do. In these slides and videos, we cover SEO landscape changes and the current state of SEO for Travel Companies in 2018. It covers aspects of technical SEO for travel companies, content creation specific to the travel sector, as well as how to boost authority signals and link building for travel companies in 2018. Yes. But not in the way you think. Google and TripAdvisor remain the gatekeepers when it comes to travel research. Qualitative user research by Google shows how users interact the most with other key entities in the travel space. Google is moving away from results to answers. There’s no more room for basic answers. Publishers need to move to complex answers in order to survive. This is the difference between a vertical and horizontal algorithm. A vertical algorithm, like dating sites have, will tell you who the best person is for you, while a horizontal algorithm will tell you what the best restaurant in town is, based on a set of universal sources. SEO is still holding 40-45% of all searches. While SEO results are still getting around 45% of click-throughs, AdWords is getting more visibility across search engine result pages. Whether through classic AdWords or tools, including Google Flights and Hotel Ads. Google Features are also getting a greater share of clicks. This is in order to fast track part of the journey where they don’t make money. While maxing out commercial terms. They are bypassing the results page altogether, removing the need for SERPs for high volume, low commercial queries. This increases competition on commercial terms. It is now rare to find results without certain features. This is an opportunity for businesses to build more engaging content from the time of search. For many publishers and brands SEO, 2018 has been a tough year. Google algorithm updates have been more frequent and targeted publishers and affiliates. Those who weathered the storm had better content and UX (user experience). Many algorithm updates are now rolling updates, meaning no jump or drops overnight for most websites. Major algorithm updates are now part of the main algorithm. This means no more excessive jumps or drops for most websites. We’re seeing either some pages are penalised or the whole site progressively fades. Link quality is now also a constant. Artificial intelligence brings full context to queries. AI can process a whole new set of signals, changing the DNA of ranking factors, like situational awareness, context and intent and UX graph. Google remains the main source of traffic for most websites. Mobile matters more than ever in 2018. AMP significantly reduces page size. Make sure you adjust your tracking for AMP. Use either a plugin or Google Tag Manager to implement valid tracking. We love AMP plus progressive web apps. This is one of the key factors leading to a technical SEO renaissance. There’s a bit of a learning curve on both sides, including some testing and dev resources. Google landing pages coded in AMP are lightning fast, loading focused on delivering the main content rather than loading ads. With the rest of the site coded as a PWA this provides a rich user experience using mobile hardware. Native Apps enable site designers to access phone hardware. Normal web sites cannot access these resources. Tagged, structured content enables a multi-use approach. Rankings based on DB data is going to be huge. HTML Crawl, indexing and ranking is a resource intensive and inefficient process. Structured markup is a way to speed things up but it still depends upon relevant content. DB often holds the freshest, most accurate dataset. [patent] Resource identification from organic and structured content. Kudos to SEObyTheSea for finding it. Personalised search is going to increase. This will make ranking results blurrier. Google is also gaining stride when it comes to app indexing and deep linking. This provides an individual experience. But don’t panic. Personalisation doesn’t have to work against you. When someone searches for your target keyword for the first time, you’ve got to do your best to appear among the top results in the unbiased search results page. If the searcher clicks on your listing, you’ll become their preferred entity, and their subsequent searches will most likely include your site as the top result. Schema.org is a vocabulary (of many), but is really more comparable to a dictionary. “I want to live in a world where schema is not that important, but currently, we need it. Schema is soon to include speakable. This is going to be sweet! What Makes a Good Voice Answer? Similar to featured snippets, short, sharp answers is what Google and it’s users are looking for. What to Write for Voice Search? RankBrain increases performance for quality content. Read more about how to optimise for RankBrain. RankBrain cares about dwell time. Visuals, videos and tools help to engage users but can also help answer queries. RankBrain sometimes ranks pages higher up than they “should” rank. Good CTR (click-through rate) can bump up your rankings as Google sees your result as a better answer. Too many sessions are bouncing and users are not engaged. Driving greater onsite engagement and attention will lead to better conversion. Test your layout and increase page speed to improve time onsite. Sticky engagement beyond on-page CRO tactics. Having a user centre and developing an integrated solution brings data and automation into the system. It’s rare for a piece of content to achieve both of these goals successfully. Always pick your objective for each piece. Build content where you can still capture user interest. Capture attention at the “I want to get away moments” (dreaming moments) in order to spend less at the “Let’s book it” (booking moments) stage. Win the SERPs over by creating in-depth, detailed answers. Build authority and depth of content in your niche. Create semantic relevance which is good for RankBrain. This will help you to become a trusted source. Get more visibility via feature snippets and voice search. Create a semantic keyword footprint across a whole topic. Related keywords = semantically connected. Google is going to view this as critical to proving that your content is relevant to the searcher’s query. For example: Which apple are you talking about? Rank with in-depth reviews. OTAs and booking sites are transactional in nature. They don’t do a great job when it comes to detailed reviews. Partner with unique hotels/tours needing more visibility. 1 in 5 searches is for an image. The recent change to Google’s layout will drive more traffic to your pages/posts. You’re also less likely to get your image “borrowed”. 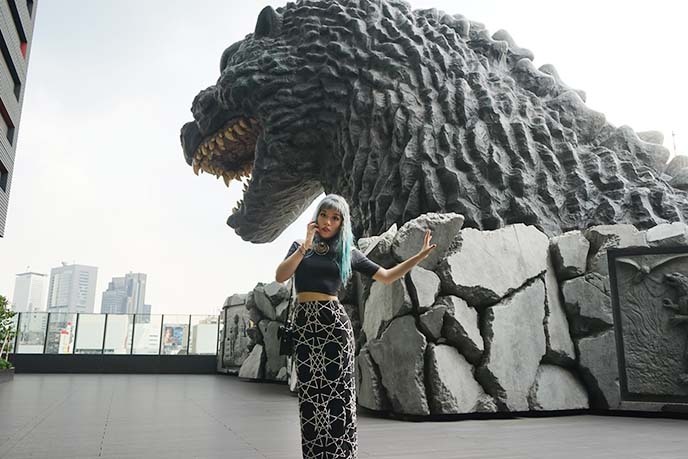 Relevant copy close the image: Did you know you can stay at a Godzilla monster themed hotel: Hotel Gracery Shinjuku? Harder to optimise small images (<500px), Google doesn’t favour those of course. (There are exceptions). Larger images (>2500px) should be OK. In fact. Google has the tools to filter by image dimensions. It’s not yet clear if Google uses image EXIF data in their algorithm. If you copy-paste keywords/phrases for multiple images, they’ll matter less in Google’s eyes. As with regular web searches, Google wants to show unique images that are relevant with the user’s query. Working on all this image SEO is not easy. Do it manually a few times, and then try to work out a routine for whenever you add more images to the site. Try to cover as many of the image SEO factors above as possible. SEO is a by-product, what else should we do? With more signals coming in, multiple points of authority become necessary. Yes, links still matter… a LOT. Getting links to your site still matters. Make sure you strive for quality over quantity. Search engines judge you by your links. Your website is unique, interesting, engaging, etc. What are You Asking Them to Link to? Bing uses it as an authority signal and a patent by Google (along with observations from many SEO experts) indicates that Google may be doing this as well. So get out and build your brand name, even if you don’t get a link back. By opening up additional mediums and channels we can exponentially increase audience reach and user acquisition. 60% of consumers watch branded videos on a daily basis. Creating a strong instream video presence on YouTube and Facebook can open up a new channel of consumers for your brand. Like standard SEO, start with a niche target. Build around a closely knit set of keywords. Test and learn what works best when it comes to duration. Leverage video content across all mediums (website, email, etc.) to rack up views and engagement. A successful strategy will blend the discoverability of YouTube, with the engagement of Facebook. As a search engine, YouTube exposes users to new content based on search intent. 55% of consumers watch branded content at an engagement rate of 32%. Facebook exposes users to a greater volume of branded video (60%), at a higher engagement rate (49%). Go where the world’s best content publishers and creators are, on Flipboard. While Australia is a small market, presence continues to grow. AND go where the world’s smallest publishers are competing with media giants, Medium. With 74 million global users, Medium.com is rapidly growing. Online publishers are independent content creators are moving their content there.